Built 1926 by Alois Kaindl. 900 seats. Opened 1927 with performances of the local "Passionsspiele" (Passion Play). Again used for passion plays in 1935, 1936, and 1937. After World War II, used as a film studio. From 1955, again used for passion plays. 1999 interior refurbishing. 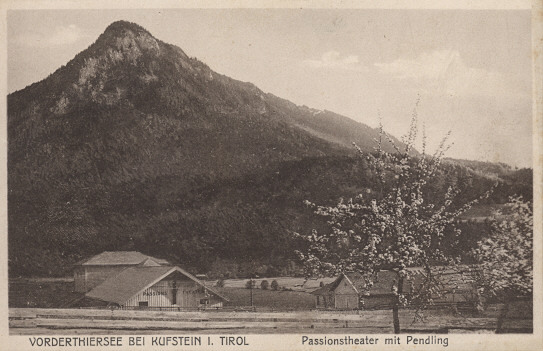 Front Text: "Vorderthiersee bei Kufstein i. Tirol, Passionstheater mit Pendling"
Reverse Text: stamped: "Passionsspiele 1927 Thiersee"